“When their father, an eccentric scientist, passed away, the four brothers were eager to find out which of them would inherit the family heirloom; a rare collection of antique coins. They were disappointed to discover that their father, knowing how much they all enjoyed games, planned to have his servants hide the coins around the house for a bizarre family treasure hunt. On Saturday morning the servants hid the antique coins in various locations around the mansion and then the four sons spent the day searching every nook and cranny, desperate to be the one to find the most coins. By Saturday night one of the sons, much to the annoyance his brothers, had won the game and, having found the most coins, gained a considerable inheritance. 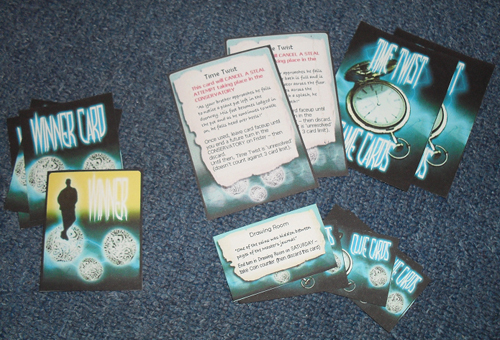 Desperate to get their hands on the inheritance, each of the brothers had the same idea; use their time machines to change the outcome of the game. Based on their father’s prototype, their small time travel devices could enable them to travel back no further than a couple of days. Even the winner of the contest, suspicious of his scheming brothers, realized that he should also travel back to make sure that he was still victorious. 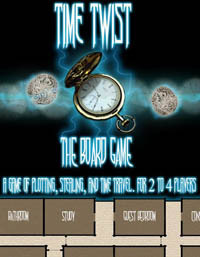 Time Twist is a game of plotting, stealing and time travel, for 2 to 4 players. Taking on the role of one of the brothers, you will gain a clue card and then travel back to Saturday to claim a coin. You will have to then return to Sunday to acquire another clue card. Other players can use game cards to steal coins from you. Stealing can be blocked by using a trap (a Time Twist) which you set up on Friday – you must of course remember to travel back to Friday to set that trap up or it will never happen! Avoid being lost in space and time as you manipulate time and use every low down trick you can think of to claim your rightful inheritance. All game, and board, files are included. Players will need to provide a 6 sided die, and 14 plastic stands (not essential).